Showman ® Headstall and Breast Collar Set with Brown Filigree Inlay and Praying Cowboy Conchos. This headstall features brown filigree print overlay on browband and brown filigree inlay on oval cheeks accented with copper colored studs. Bit loops and browband are accented with copper colored engraved praying cowboy conchos. 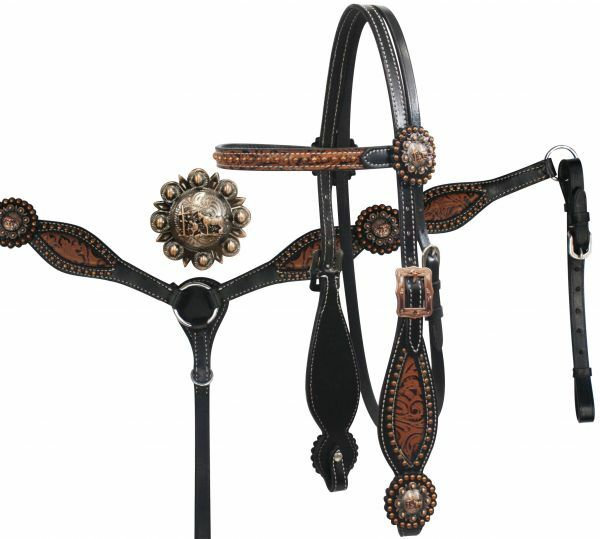 Copper colored engraved buckle gives this headstall a vintage look. Breast collar features scalloped style with brown filigree inlays and copper colored engraved praying cowboy conchos accented with copper colored studs. Headstall comes with 5/8" x 7' reins.